When you are staying at Walt Disney World resorts and spending all your times at Disney theme parks, there doesn’t seem to be much else going on in the world. As its otherwise been a slow week, my thoughts on science fiction this week are limited to the sci-fi themed areas of Walt Disney World. There’s plenty of science fiction at WDW, often with rides where something “goes wrong.” Even Animal Kingdom, the last theme park where you might expect to find SF, there’s the Dinosaur ride where a rogue scientist at the Dino Institute reprograms a trip to the past to send you to the end of the Cretaceous period, moments before an asteroid kills off the dinosaurs, to bring back an Iguanodon. At the Disney MGM-Studios a routine trip to Endor goes off track when the shuttle is piloted by an inexperience droid on Star Tours. The ride is easy to find. 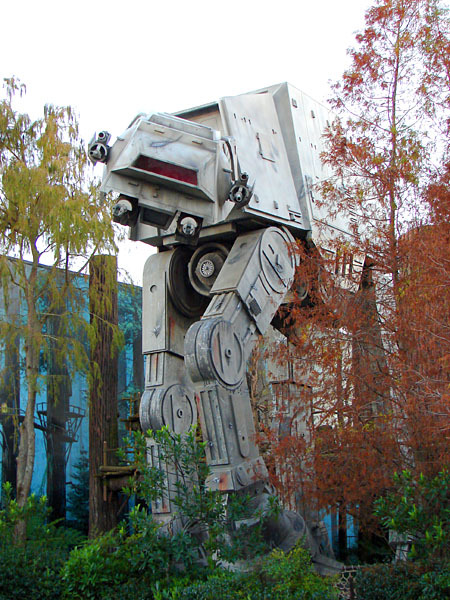 It’s the one with the giant AT-AT walker outside the entrance. Inside you’ll see R2-D2 and C3PO before taking off. If you need a snack before your trip (or perhaps after if the jolting ride might make your meal come up) you can always eat at the Sci-Fi Dine-In and watch sci-fi clips. Epcot’s Journey into Imagination Pavilion also has an exhibit where the entertainment comes when things “go wrong” as Professor Wayne Szalinski wins the Inventor if the Year Award in Honey I Shrunk the Audience. You can guess from the name what happens. Epcot has many science themed exhibits, including Spaceship Earth and Mission Space. Innoventions displays tons of gadgets, both currently available and those being developed. I’ve seen many of my “toys” on display there. The heart of science fiction at Walt Disney World is Tomorrowland at Magic Kingdom. This includes Space Mountain and Astro Orbiter. Tomorrowland Transit Authority is a great way to rest your feet and get a tour of the area. The ride even goes into Space Mountain, and one year while they were refurbishing Space Mountain I got to see how it looks inside all lit up. Carousel of Progress and The Timekeeper aren’t open very often any more, but shouldn’t be missed if you have a chance to see them. I suspect Timekeeper may be gone for good as the site is being used to build a new comedy club hosted by the monsters from Monsters, Inc. The most complex themed exhibit at Tomorrowland is Stitch’s Great Escape, but all in it is a dud which isn’t worth the time. 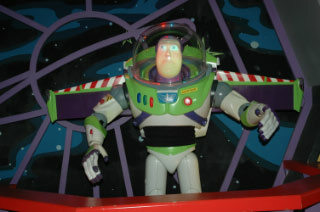 My favorite ride of all at Tomorrowland is Buzz Lightyear’s Space Ranger Spin. The ride is also a giant arcade game as you help Buzz fight Emperor Zurg. To roll up a high score, aim for the top of the volcano, the Z on the robot’s left wrist, the bottom of the batteries in the battery room, the worm-like creature, and the spider. A cast member also told me that if you hit one of the targets spinning high up along the route it will jump your score up to the maximum possible. Psychological testing answers the question. Check out the study here.